Princi is one of those places that I go quite often but never think to write a blog post about – and I really don’t know why. This place deserves praise so after my latest visit on Friday, I have decided to give it some. Situated in my favourite area of London, Soho, Princi is the brainchild of Alan Yau, also known for extremely popular Busaba Eathai, Wagamama, Hakkasan, Yauatcha, Sake No Hana and Cha Cha Moon. In fact, one of my favourite ‘cheap eat’s’ restaurants in London is Busaba Eathai – a more upmarket version of Wagamama, serving fusion Thai food that you can get no where else. The Calamari is to die for and each dish oozes flavour – my favourirtes are Ginger Beef, Pat King Talay (a sea food dish) and simple Noodles with Smoked Chicken and Chinese Brocolli. The Chinese Brocilli side is also an absolutel winner. But I’m not here to talk about Busaba, yet another frequently visited restaurant that I haven’t written about yet, I’m here to talk about Alan Yau’s newest venture, Princi. Before you even step inside, the in house bakery, large roaring Pizza oven and long row of freshly baked Italian style breads and cakes lures you in. When you do eventually get inside, you have to be lucky to secure a table – the trick is to go early before the mad rush. If you don’t, you’ll probably be lurking around for a while waiting for someone to move. Towards the back you’ll find freshly cooked Pizza and Pastries, Salads and at the very back hot dishes such as Lasagne and Meatballs, sitting next to the drinks bar – this cafe also has a booze licence, which is a bonus. We grabbed a seat at the bar in front of the water feature that runs along the top – I love a good water feature. It takes the form of a long trough with taps dispersed along it, which are constantly running. There are lights towards the bottom of the trough so the water ripples make the light shimmer all the way up the wall. It looks beautiful. 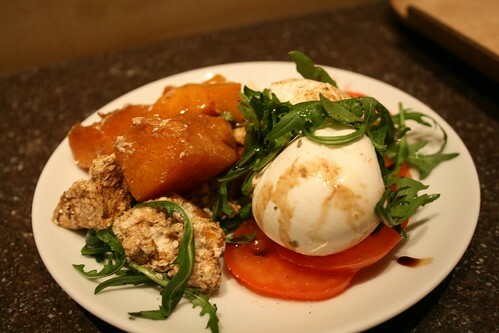 The dishes are great for sharing, they’re not full meals by any means so we shared a salad of Butternut Squash, Cinnamon Ricotta, Mozzarella, Tomato and Rocket and Sausage and Lentil dish. My boyfriend is cheeky and asked them to slip some Roast Potatoes on the plate as the dish didn’t come with any originally. They obliged and I was glad! The salad is simple and drizzled with great quality Olive Oil and thick, syrupy Balsamic Vinegar – they don’t put enough on for my liking but if they put as much as I would have wanted, they would have been down half a bottle! I can’t get enough of Olive Oil and Balsamic! I find that the ‘hot’ dishes are never really that hot, only warm, which is slightly annoying but it just means that you have to eat it quicker! 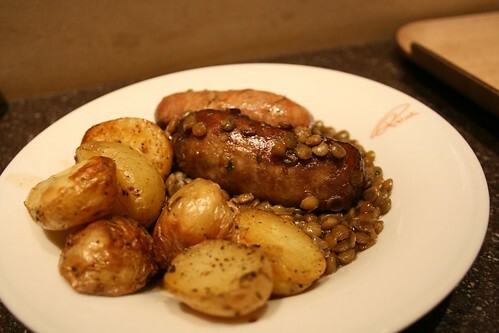 The Sausages were absolutely amazing, the lentils lovely and garlicky. We also shared one of their freshly baked bread rolls to dip up the remnants of the Lentils and the Olive Oil and Balsamic, delicious! 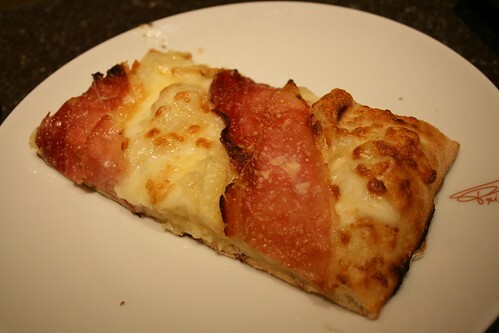 As the dishes were small, we shared a slice of Pizza afterwards. If you go, make sure you look at the baker putting the pizza in or taking it out of the oven. It is so long and it stretches right to the back of the room. The Ciabatta base is charred from the wood fire oven. I ordered a Brie and Parma Ham slice, which was delicious. I have had three cakes from Princi before and I have never been impressed. This is by no means due to the fact that they are bad quality but they are just not the style of cakes that I like. Too much cream – I’m not a massive fan of Patisserie. 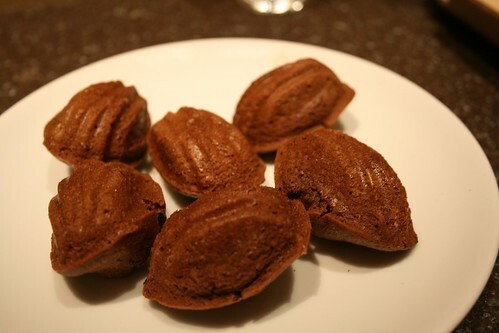 Instead I usually go for one of the mini bites that they have and this time on show were mini Chocolate Madeleines so I ordered 6 of those. I was slightly disappointed that they didn’t have any Hot Chocolate as it is fantastically creamy and chocolatey, just what I wanted to go with the Madeleines! Princi is a great cafe to go for lunch or a lite bite at dinner followed by a cake, the atmosphere is always buzzing and the food is always great. I wouldn’t expect to go here for a proper meal but when you fancy good quality sharing dishes, this is your place. You can even buy tomorrow’s Croissants and Bread while you’re there. A pet hate of mine is lukewarm food when it should be hot. I’ve heard a lot of good things about Princi but having been there, I didn’t enjoy hanging around for a table and then queuing canteen-style for food. I agree – that’s why I’ll only ever go at lunch time or early evening before it gets busy. I had to queue for my Madeleines and I felt really uneasy as people were almost arguing about who was first in the queue. Yea, the cakes aren’t really my thing either. Their pizza is definitely worth a go though, they bake it in the fantastic long wood fired oven. The hot chocolate (when they have it) is also amazing.